This October we are diving into fall with a contemporary embroidery project that will make the ritual of unwinding from the day, sliding into those soft slippers and enjoying an evening cup of tea perfectly irresistible. 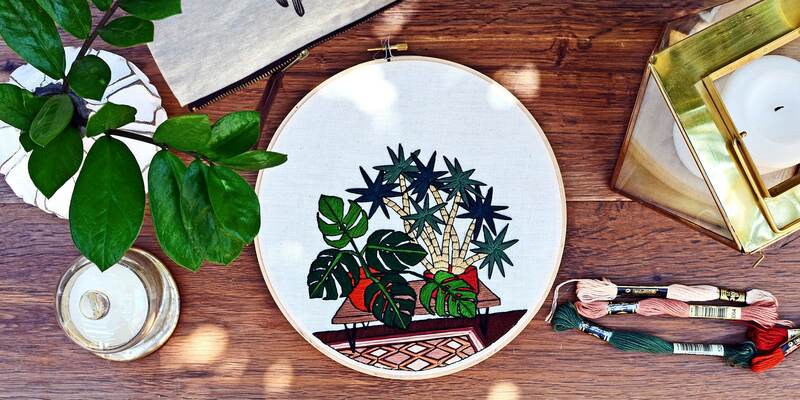 The Crafter's Box is exploring stitches with Sarah K. Benning, the wonderful fiber artist whose signature Midcentury-meets-potted-botanical motifs have stirred a contemporary embroidery revival. New members are welcome to join us between now and September 20th to enroll in this workshop, current members are already in. In addition to a really lovely and detailed workshop (our longest digital workshop to date), Sarah's project features a custom signature pattern, a detailed stitch glossary (a brand new and insightful publication from Sarah) and a beautiful embroidery carryall bag in collaboration with French artist and Brooklyn-based designer Amelie Mancini. More about our artist: Sarah K. Benning is an American fiber artist with a nomadic studio practice. Originally from Baltimore, she attended the School of the Art Institute of Chicago and received her BFA in Fiber and Material Studies. Shortly after graduating in 2013, Sarah discovered her love for embroidery and has never looked back. She often abandons traditional stitches and techniques in favor of bold shapes, playful patterns, and contemporary subject matter. Sarah currently splits her time between the US and Menorca, Spain. Though Sarah's formal training is in the arts, she is self-taught in the craft of embroidery. She approaches each piece as an illustration, creating a drawing in pencil directly onto the fabric before filling the image in with thread. In this way the thread become more like ink or paint than traditional needlework and the stitches accentuate each shape that builds the composition. Sarah's work is inspired by plant-life, interior design trends, and a deep love of Midcentury Modern furniture and antique rugs. Over the course of several years and a lot of trial and error, Sarah has developed a very distinct embroidery style and aesthetic. In addition to exhibiting and selling finished pieces, Sarah shares her love of embroidery though a monthly Pattern Program and occasionally teaches workshops and master classes. Follow Sarah on Instagram and visit her online shop to see more of her beautiful contemporary embroidery work.